rec. St Mary’s Walthamstow, London, 6-8, 13-14 February 2012. DDD. Though he was highly regarded in his day, the 250th anniversary of the death of Francesco Geminiani passed almost unnoticed by the record companies; as usual, it was the smaller independents who noticed and did something about it. There are new recordings of his music from Early Music and Tactus and this set of the Op.1 Sonatas from Somm. 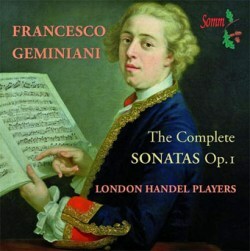 These sonatas are much less well known than his concerti grossi; indeed, Geminiani’s music in general is hardly over-recorded with only the second half of the wonderful Harmonia Mundi AAM/Manze recording of his twelve orchestrations of Corelli still available on CD (iTunes and Amazon offer the complete set as a download) and he doesn’t feature at all in the cut-down volume that now passes for the Penguin Guide. Though there is a recommendable budget-price Hyperion Helios recording which includes Op.1/3 and the Trio Sonata arrangements of Op.1/9, 11 and 12 (Purcell Quartet and Band, CDH55234- review), the new release of the complete opus is particularly welcome. The Newcastle composer Charles Avison, who had met, possibly studied with and befriended Geminiani during his stay in London, thought sufficiently highly of the whole set as to rearrange eleven of the twelve as Op.1 sonatas and in the preface to his Op.3 concertos wrote that his friend was ‘the greatest Master of Instrumental Music’. The set of Avison-Geminiani concertos has recently been recorded by the Avison Ensemble, directed by Pavlo Beznosiuk, who has added his own arrangement of Op.1/11, the one work from the set that Avison appears not to have worked on. (Divine Art DDA21210, 2 CDs - review and November 2010 Download Roundup). All but one of the Op.1 sonatas on Hyperion are of the more immediately attractive sonata da camera type, but the first six sonatas from the set are of the sonata da chiesa type, so we have a more rounded representation on Somm, including some arrangements for harpsichord alone or with the recorder or flute - and who better to perform this music than the London Handel Players who have given us fine recordings of the Handel Op.5 Trio Sonatas (SOMMCD044 - review) and a selection entitled Handel at Home (SOMMCD055 - February 2011 Download Roundup). Regular followers of the London Handel Players will not be surprised to learn that they take the four sonatas which are common to both recordings at a more stately pace than the Purcell Quartet. Note that I didn’t call the Handel Players slow or the Purcell Quartet fast, because it isn’t just a matter of timings and both interpretations work extremely well for me. In the sonata da chiesa Op.1/3 you may think that the Handel Players’ slightly grander interpretation works slightly better than that of the Purcell Quartet. In the sonate da camera, on the other hand, you may prefer the slightly brisker - but not always faster - Purcell Quartet versions, but I wouldn’t stress the differences too much in either case, especially as it’s not possible directly to compare Geminiani’s own arrangements of Op.1/11 and 12 (Hyperion) with the Barsanti version of No.11 and the original 1716 version of No.12 on Somm. In Op.1/9, where both sets of performers choose the 1739 version for violin, cello and harpsichord, the newer Somm performance is actually slightly faster overall, especially in the second movement, andante, and the allegro finale, yet the overall impression remains that the Handel Players give the music slightly more gravitas. The Somm recording comes with a very fine set of notes written by Rudolf Rasch and Adrian Butterfield, even outdoing those which come with the Hyperion which, for once, are a trifle sparse. The booklet is so large that it’s hard to get it in and out of the case. The new recording, too, is marginally to be preferred to the Hyperion; though the latter is bright and fresh, the Somm shares these qualities but gives a slightly fuller sound-picture, from which the harpsichord particularly benefits by being more audible without sounding too prominent. The Hyperion Helios reissue is a notable bargain - you should be able to find it for around £6 - especially since it casts its net wider than the Op.1 Sonatas, including Geminiani’s Concerto Grosso on Corelli’s la Folia, the ear candy of the 18th century, and the Concerto Grosso, Op.7/2, another wonderful Corelli-inspired work. With bright performances and recording it remains a very desirable purchase. For lovers of 18th-century chamber music and of Geminiani in particular both it and the new Somm recording are practically mandatory. If, as I recommend, you start with the Hyperion you will almost certainly wish to go for the Somm set as well, so you may as well get them both together.